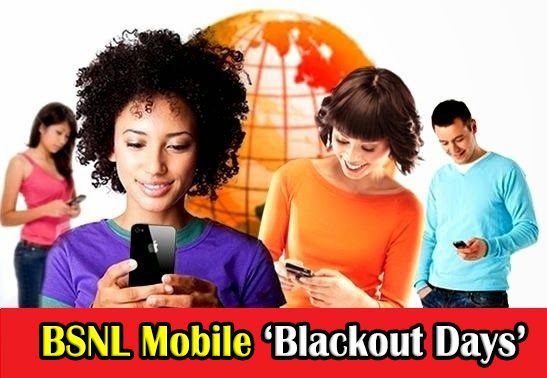 Bharat Sanchar Nigam Limited (BSNL) has declared pre-Diwali (17th October 2017) & Diwali (18th October 2017) as Blackout Days for both Prepaid and Postpaid Mobile Customers. On blackout day, No concessional tariff on Voice Calls / SMS will be available for both prepaid and postpaid mobile customers. Blackout will be for all Voice / Roam / SMS / ISD STVs, Friends and Family Offer, Free Calls to Pyari Jodi Landline, Plan Voucher Freebies etc. this include Voice STVs 135/149/159 etc. also. It means, a prepaid mobile customer has to top up for main account balance for making voice calls / SMS on these days. Customers are advised to make use of the existing Full Talk Time / Extra Talk Time Offers and Diwali Special Extra Talk Time Offers on these days. BSNL's Special Combo STVs (Combo STV15, Combo STV77 & Combo STV177) offer Full Talk Value & Free Data for prepaid mobile customers. These promotional combo vouchers can be used on these Blackout Days also.